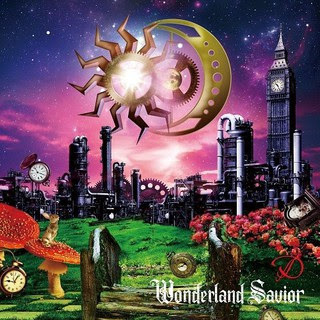 REVIEW: D's Wonderland Savior | VKH Press – J-Rock & Visual Kei Coverage Worldwide! Around 2 years had passed since D released their last album before a brief hiatus. Typically speaking, taking creative breaks is a positive thing that reinvigorates an artist's passion for what they do. After such a big album like Kingdom, I don't think that a break was unjustified. They have had a pretty lucrative and popular career up until that point, but what seems to have happened this era, at least initially, is that they fell back into a somewhat overused theme of Alice in Wonderland for yet another album. But did it work? Did they save Wonderland? The album starts with a series of songs that would have actually made a really interesting track if they were all combined into one. "Dream in Dream" is a really pretty intro that's composed exceptionally well that gives you an idea of the dreamy journey you're about to take. Otherwise, it doesn't do much on it's own. "Tsukikage no Jimeikin," however, could have been an intro all on it's own. It is a pretty solid track, but has a lot of qualities that make for a good intro: lyrical simplicity, a melody that isn't too overtly complex, and the ability to transition directly into the next song as though it was meant to be that way from the start. The sounds of gears at the end of this track blend directly into the title track of the album, and possibly the most killer in terms of energy and melody. The only one of these three tracks individually that makes a big splash is the title track, "Wonderland Savior -Taiyou to Tsuki no Haguruma-." The track is rather lengthy, but it is quite clear that it will be worlds of fun to see performed live. Asagi's voice is entirely on point through the whole song. He didn't need the vocal distortion parts, but they did provide something new that we haven't really seen from the band before. The following three tracks are about as interesting. "Keep a Secret" is pretty typical D fare, insofar as it's a bit darker sounding than any of the previous songs. However it is more lyrically complex than the previous songs and recalls to mind the Kingdom era's emotional feel. I'm not even sure how to tackle the next song. "Kaiou..." has been a mystery to me since the track list was revealed because I don't know what to make of the title, let alone almost anything the song is about. What I can say is that it almost seems like a working class man's anthem in how it talks about the president being as important as the worker and so forth. My favorite part of this song is how it somehow transitions into using whale calls as music and it works so well. This is followed up by the song obviously dedicated to the Cheshire Cat. It is an entirely different number than what we've seen so far this era. A jazz/rock crossover song that actually doesn't sound like every other jazz-inspired VK song out there. "Fuchsia Pink..." is an absolute jam featuring piano runs to simulate a cat walking on the keys, rhyming lyrics, and a catchy hook! The remainder of the album goes on in somewhat of a cycle between being great and being mediocre. Many fans crucified "Happy Unbirthday" and "Master Key" for being basic and generic singles. I tended to disagree with that. Not only is "Master Key" at least a fun song, even if it isn't great, but "Happy Unbirthday" is one of their silliest, happiest songs from a band that truly enjoys being melodramatic over anything else. Plus, "Funny Bunny!" ("Happy Unbirthday's B-Side) has quickly become one of my all time favorites. The other album tracks had a lot of potential, but only some actually delivered. A song about Schrodinger's Cat was a pretty welcomed surprise, but the song didn't stand out. The same can be said about "Mizutamari no Sora" and "Psychedelic Horror Show," great songs with great concepts, but there's not a lot that makes me remember either of them vividly. The best parts about the last segment of the album are "Underground Revolution" and "Nanairo Kakumei" due to the fact I, personally, am obsessed with songs about revolution and the energy given in "UR" is exactly what you would want and expect. "Nanairo Kakumei" is a bit more subtle in nature and significantly more dreamy. A good touch of the beginning of this journey right at the very end. While I think the lyrics and melody are there, I think they could've made it a bit less subdued to end an album with. In other words, it isn't particularly climactic. So, while opinions on this era of the band may vary, one cannot deny that there is a lot of good at work here. 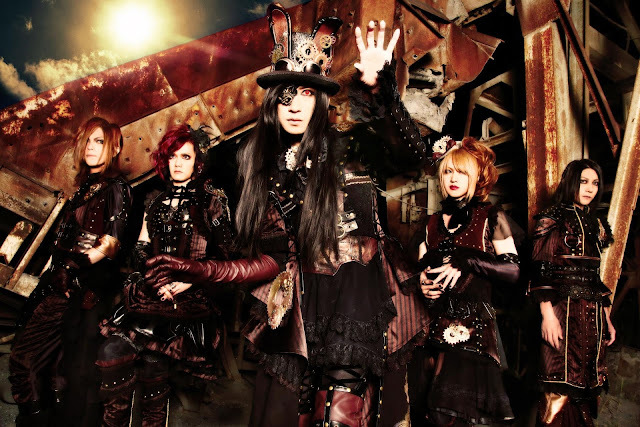 Asagi still sounds fantastic and they haven't lost their edge in composition. Potentially, they just needed to get this out of their system. Maybe they just needed to be a bit goofy and have some fun making music and then they can return to the ever-popular songs about vampires. Only time will tell, but for now I am beyond thrilled with the result. Please support these talented musicians by purchasing the album here!